The zonal auditions for the ‘Mr Arunachal and Miss NEFA Arunachal 2018’, which was marked as a calendar event by the state government last year, will commence soon. Making the formal announcement in a press conference at the Arunachal Press Club here, former Mr International India Opang Jamir informed that the zonal auditions will be held at four districts, viz., Tezu, Daporijo, Pasighat and Itanagar, and the grand finale for both the title will be held in the month of October. 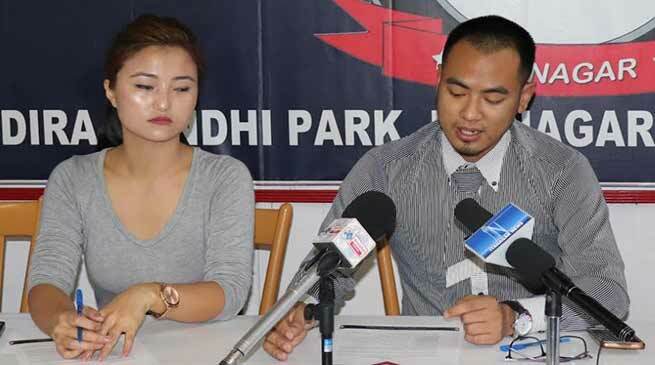 “The criteria for ‘Mr Arunachal and Miss NEFA Arunachal 2018’ will soon be published in the official website and Facebook page of the event”, said Jamir. The event is being organized by Mr Arunachal & Miss NEFA Arunachal organisation with the motto of “Think globally, Act locally”. He said that organising of such mega event is for talent search in state of Arunachal Pradesh to give them a platform and the winner can become brand ambassador of Arunachal, this time the event shall be bigger and better one than the last. Mr Arunachal Ginggu Metum Timba, Miss NEFA Arunachal Tenzin Chonzom, Mr Arunachal and Miss NEFA Arunachal organiser Taniya Budh also spoke and elaborated other issue and activities of the events.